Canon Inc. has announced that the Company’s interchangeable-lens digital cameras (digital SLR and compact-system cameras) have maintained the No. 1 share of the global market for 15 consecutive years *1 from 2003 to 2017. Canon develops the key components featured in its interchangeable-lens cameras—CMOS image sensors, image processors and interchangeable lenses—in the pursuit of “Speed, Comfort and High Image Quality, the core concept of the EOS series.” The Company effectively responds to the needs of a wide range of users through its extensive lineup of cameras catering to all levels of photography from beginner to professional and a total *2 of 93 EF series interchangeable lenses. 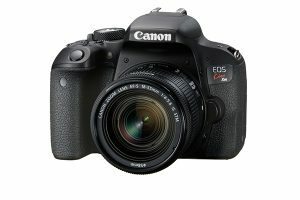 In 2003, the dawn of digital SLR cameras, Canon introduced its breakthrough EOS Kiss Digital (EOS Digital Rebel or EOS 300D Digital in other regions). This groundbreaking camera, which was competitively priced and featured a compact, lightweight design, captured the top share of the global market and set the stage for growth in the digital SLR market. 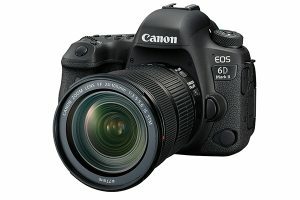 Since that time, Canon has continued to launch a range of groundbreaking products, including the professional-model EOS-1D series and the EOS 5D series, which paved the way for digital SLR video recording. 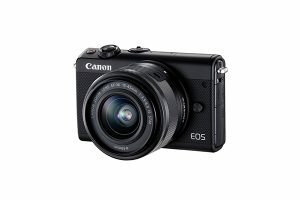 The Company has further bolstered the EOS lineup by continuing to introduce new products including accessories, interchangeable lenses and the EOS M series of compact-system cameras. During 2017, Canon introduced the EOS 6D Mark II as part of an impressive lineup of interchangeable-lens camera products *3 that supported the Company’s achievement of a 15th consecutive year at the top of the global market. *2 Includes two EF lens extenders, two models not available in Japan and fourteen EF Cinema Lenses. As of March 28, 2018. *3 A total of six digital ILC cameras were released in Japan in 2017: The EOS 9000D (EOS 77D in other regions), EOS Kiss X9i (EOS Rebel T7i / EOS 800D in other regions) and EOS M6 in April 2017; the EOS Kiss X9 (EOS Rebel SL2 / EOS 200D in other regions) in June 2017; the EOS 6D Mark II in August 2017; and the EOS M100 in September 2017.